High temperatures today reached the lower to middle 40s, just a couple degrees above the normal temperature for this date. A light breeze out of the south combined with plenty of sunshine until the mid-afternoon allowed our temperatures to reach values slightly warmer than normal today. Dry weather extends across Wisconsin and Minnesota, and we will see partly cloudy skies tonight. Moisture currently near the Minnesota-Canada border in the form of rain and snow showers (depending on local temperatures) will travel on path toward the southeast. We will see a wintry mix or rain showers entering Northern Lower Michigan tomorrow morning, the highest chance in Northeast Michigan will occur during the afternoon, and possibly continue into the early-evening. 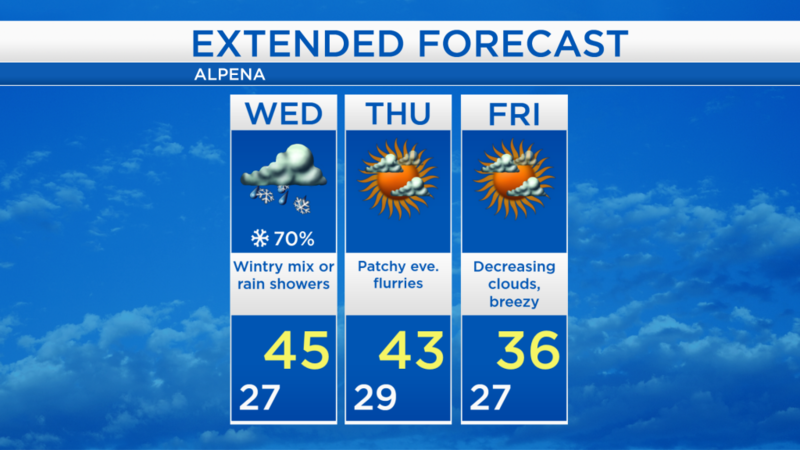 Tomorrow morning will start with mainly cloudy skies until a wintry mix arrives with temperatures close to 30 degrees. Afternoon highs will reach around 45 degrees with a high chance of rain showers for most places, otherwise a wintry mix. 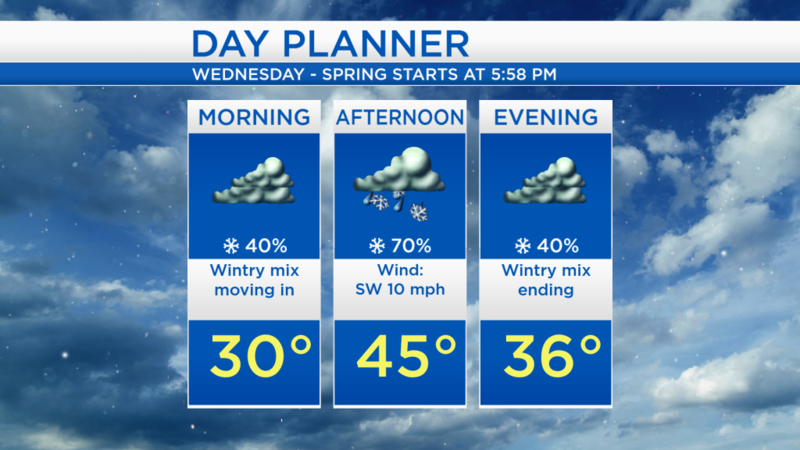 The wintry mix of rain/snow will end during the evening as temperatures drop to the mid-30s. 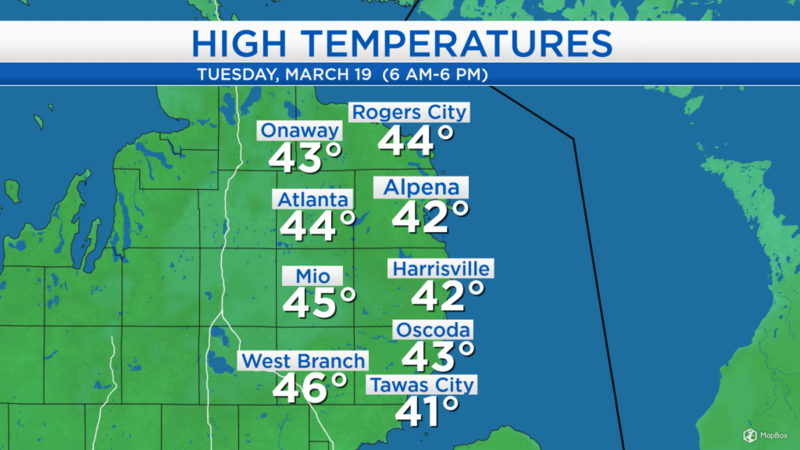 Afternoon temperatures will reach the mid-40s for the next couple days. On Friday, a strong breeze out of the north will bring colder air to our area for a day. Temperatures will rebound into the 40s Saturday afternoon, and the forecast shows temperatures warming to the lower 50s on Sunday. Tomorrow afternoon will likely be wet, so take a few extra minutes for any travel on the roads. Early-morning low temperatures will also level off in in the middle or upper 20s, so we can enjoy milder temperatures during the early-morning ours as well. Thursday daytime we will likely see a mix of sun and clouds, then a few flurries are possible Thursday evening and nighttime. Cloud cover will decrease on Friday although we will feel some colder temperatures, continuing into early Saturday. 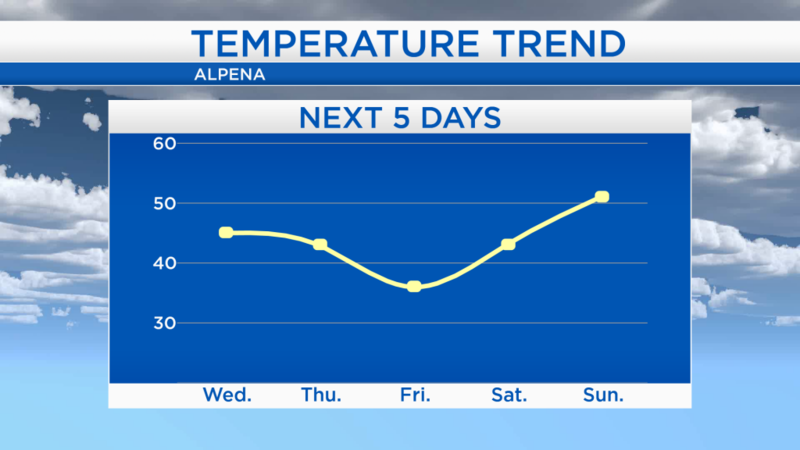 By Saturday afternoon, temperatures will reach the 40s under sunny skies. For the rest of Northeast Michigan’s weather forecast, watch the latest weather video by clicking the weather tab at the top of the page.